We have conducted Basic Firefighting Seminar to Grade 10 CAT students of the Maria Montessori International School. Maria Montessori International School (MMIS) Talamban Campus is located in Bgy. San Jose, Talamban Cebu City. The school is a private acadame composed of the preschool as well as Grade School and High School Departments. 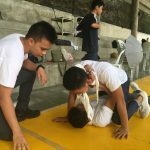 The seminar was spearheaded by their adviser Mr. Julius Yburan who is very active in training the students on the aspect of First aid and safety. 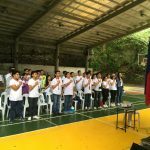 The program started with the singing of the Philippine National Anthem shortly after the short prayer. 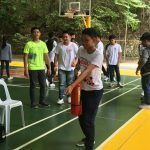 During the seminar, the students were taught the basic principles of fire, and of course the use of the fire extinguisher. Evacuation procedures were also thought as well as aiding someone in the event of evacuation. It is very important that at a young age, a person will know what to do in such cases. We have to consider that anyone can be in a situation where a fire suddenly happens and knowing what to do and how to act on such event will surely make the difference between survival or death, between injury and being well. Our training center is committed to educate and train people may it be at a young age. After all, calamities and disaster does not choose a victim. To the young Grade 10 CAT students… My Salute! To their adviser, our sincerest gratitude and our outmost respect……. This entry was posted in News and Events and tagged evacuation drill, fire exinguisher, firefighting, safety, training on October 14, 2017 by basiclifesaving.